My father buys his borscht in screw-top jars, usually Streit's or Gold's, and keeps them in the fridge. Since my mother doesn't eat beets, my father doesn't bother cooking up a batch of the homemade stuff just for himself. Unlike the creamed herring, and U-Bet syrups -- other foods my mother won't touch but that my father loves and keeps in the house -- I never had any desire to taste this jarred borscht. The color was off-putting and it seemed weird to eat soup out of a jar. That was then, as they say. My conversion happened a few years ago. I was on a date at Veselka. We sat outside and drank our Pilsners, and then my date surprised me by ordering a bowl of borscht (and he wasn't even Jewish! ), while I ordered my chicken soup. I was intrigued and curious about his soup choice, so I tried a spoonful. It was tangy, refreshing, sweet and salty (like me! ), with a deep, purple-red color that was simply beautiful. 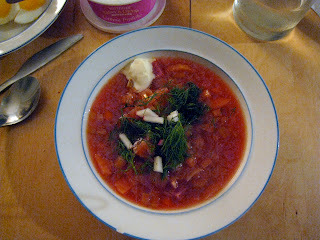 Yesterday, as I woke to a dreary, wet, and humid day, I had an intense craving for borscht. But rather than follow family tradition, I broke open James Peterson's Splendid Soups, and followed his easy instructions for a simple borscht. I made a couple of changes: I used one red beet and the rest golden, so the color is a bit less saturated, but is still a deep, penetrating ruby. Peterson also calls for beef broth, but I used homemade vegetable broth instead. I like my borscht without any meat -- it makes for a much cleaner taste that I prefer. I'm pleased to report that the borscht came out perfectly. We served it Russian-style, with sides of hard boiled eggs, boiled new potatoes, sour cream (or crème fraîche), black bread, radishes, butter, and lots of dill. I had two bowls for dinner last night and finished another for lunch today. I think I'll save the rest for my Dad. Borsht in a jar, I have to imagine, is roughly equivalent to gefilte fish in a jar. No comparison to the real thing. Nicely done! Looks delicious!